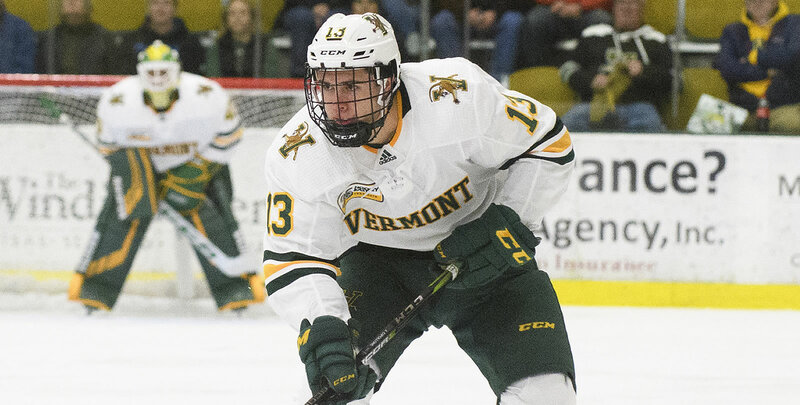 BURLINGTON, Vt. - Dallas Comeau scored his first career goal and assisted on Carter Long's first career goal in the third period as Vermont took a 4-1 win over Merrimack Friday night at Gutterson Fieldhouse. "We played a little bit tentative in the first, turned pucks over and that's where the transition came from. Once we settled in, it was the best we've skated in quite some time," head coach Kevin Sneddon said. "The other big factor was special teams. Our kill was sensational. We've been wanting to go a little bit more aggressive and our guys read their plays very, very well. The power play came up big to get us the lead. All in all a good night." - Chase Gresock scored his team-leading eighth goal of the season 6:53 into the game to give Merrimack a 1-0 lead. Following a faceoff in Vermont's end, Gresock fired a seeing-eye-shot that found the back of the net. - Merrimack was penalized twice in the final seconds of the first period to give Vermont an extended 5-on-3 power play to begin the second period. Jake Massie and Dominic Dockery each received two two-minute minors and 10-minute misconducts for hitting after the whistle in addition to the preceding Merrimack minor penalties. - The Cats tied the game on the power play just 1:21 into the second period as Matt Alvaro banged home a rebound from the slot for his third of the season. Liam Coughlin and Vlad Dzhioshvili picked up assists on the goal. - Vermont broke the deadlock at 10:48 of the second period, just 20 seconds into a power play chance, as Christian Evers wired a wrist shot to the top right corner for his second goal of the season. Joey Cipollone and Max Kaufman assisted on UVM's second power play goal of the night. - After officials assessed a five-minute major on Ace Cowans following a video review late in the second period, the UVM penalty kill held Merrimack to just a pair of shots on the extended power play chance that spilled into the third period. - Third period goals from Comeau and Long came 3:17 apart as UVM turned a 2-1 lead into a 4-1 advantage in short order. - Captain Derek Lodermeier found the back of the net on a breakaway to make it 5-1 Vermont with 2:57 remaining in the game. Joey Cipollone assisted on the goal. - UVM held a 39-21 advantage in shots over the Warriors. Vermont held Merrimack to less than 10 shots each period. - The Cats went 2-for-4 on the power play while the Warriors went 0-for-4. - A penalty laden game saw Vermont pick up 25 penalty minutes to Merrimack's 23 PIMs. - Vermont wins its third straight game against the Warriors after taking a pair of 2-1 wins last season at Lawler Arena. - With the victory, the Cats Win, Community Wins campaign and Vermont Mutual Insurance Group will donate $100 to Make-A-Wish Vermont; bringing this year's total to 17 wins and $1,700. - Tonight's game was Vermont's annual Rally Around Mental Health game. The student-led initiative works to raise awareness and reduce the stigma around mental health. Friday's game also marked TD Bank Night at Gutterson Fieldhouse.